A touchscreen and a digitizer-monitor are not the same... modern Cintiqs may have a touch screen, but it is an add on (and not all users enjoy it, as it sometimes interfere with drawing, like issues with spotty palm rejection in left hand mode creeping in in some driver revisions, strokes activating gestures etc) to the basic digitizer activity. Most DIY project here have no touch interface (one would need to write a mouse filter driver that mutes the touch mouse on pen's detection, at the very minimum). 15:6 full HD, the tablets that comes nearer are the Wacom Intuos 4, intuyos 5 and intuos pro large. Alas, these are 8 x 12.8 ", so they are some 80 pixels narrower han your screen. >As your panel is just 3.2 mm thick and has no metal plate, once you have a controller and have it up and running, ypu can simply lay it over the tablet and see how it goes. If you feel very adventurous, you can try with the Huion 1410 Gianos - it is 14" x 10 ", and I think it is the digitizer that Huion uses in their 15.6" full HD "Cintiq Knockoff". It is some 150 $, though. Wow Thanks for the info. So i dont need a touch panel to let those things work. What let the Pen working its that Green circuit board ?? PS: So After i building all' good, It Will bè pressure sensitive like 2048 levels or not? The pressure sensitivity is defined by the wacom board and pen used (so if you use a screen with digitizer like the one you linked, you will only have the amount of pressure levels that the wacom penabled tech gives you which were 512 levels iirc). Okay nice to hear this! Ok so what i need its a not too much big tablet where to draw. Im seeing some specs about Intuos 4 and 5 and what i saw is that some of they call about "Active area" . For example the Intuos 5 medium has a size of 37.9 x 25.1 cm and an Active area of 22.3 x 13.9 cm. I do not understand, this mean when i Will open the tablet to fit my 15.4 screen, i Will found an area of 22.3 x 13.9 to draw, or i can draw on all' the size dimension? I agree with this. "Artistic" tablets (intuos, cintiq, etc.) have typically 1k or 2k pressure resolution. "Embedded" tablets (digitizer hidden behind laptop/tablet screen, maybe the "signature pad" too) have typically 255 or 511 levels. There are more differences between artistic and embedded tablets. Look at Your monitor. Active area can display image. Screen size are the diagonal of active area, but dimensions include plastic frame around screen. There are two reasons why inactive area are so big. First: it's more comfortable if You have large supporting area - palm rest. Or in reverse, if You use part of tablet as palm rest, You never use it for drawing - active area can be smaller. More about second reason below. Linked tablet are typical artistic tablet. EMR tablet are made of two main components (tree if include active battery-less pen). First are electronic components that do the magic, second are antennas that communicate with pen and can determinate it's position. Artistic tablets have only one PCB. Antennas are in the middle, electronic components are located around antennas. That are the second reason why artistic tablets have dimensions mush bigger that active area. I cannot search photos now. Hope You understand that explanations. I Just would like to know If i can maximize the tablet dimension. I exlain. I would like to put a 13inch screen into the Intuos 5 medium. As i saw i can put it in the tablet cause the screen fit really well and i would use agood area to draw. But i dont know If i can put only a screen large like the Active area is large. For example If i have an Active area of 12"" i can put a 12"" only or i could put a bigger screen also??? You can put a larger screen on top of it but the pen will only work inside the active area and calibrating it will be pretty annoying. 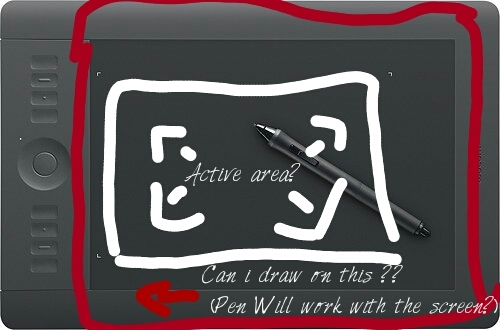 so this mean only Active area Will work with the Pen or i could have the possibility to get work the full Black area? Your pen will work everywhere it did work without the screen in between. so i can buy a Intuos 5 medium and fit my 15.6 screen?? the active area (at least on my intuos 3) is the area that is dark gray on your image. idk what the white marks are for but they are not the hard marks where the active area ends but on the intuos pen end touch my brother got, the active area is a bit bigger than the marks but doesn't extend all the way to the edge of the tablet. I can't really say anything about the intuos 5 but I'd guess that the active area (aka the area where the pen works) is a bit bigger than the markings but not the whole dark gray area and definitely not the (light-gray) case. Okay Perfect Today in gonna get a Intuos 4 large 100€ , then guys what do i need ?? The board for the LCD? Do u have some ideas ? You will need an LVDS converter board for your screen. you can find these for your screen on ebay. if you can't find one specifically for your display, you can write a message to one of the sellers with your screen part number and ask if they support it.